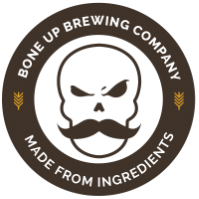 Stats: Josh - Bone Up Brewing Co.
Color: Black as a moonless night, with hints of lightness at the edges not unlike the dawning day. Brewers' Notes: A couple Friends Of The Brewery (Jodi and Josh) somewhat recently announced to us that they'd be getting married, and we announced right back that we'd be making special beers for their wedding! The two beers are made to be blended at serving (they're made to go together, get it?) but you can drink 'em on their own too! This beer - Josh - is a roasty, almost smoky stout with a big chunk o' chocolate wedged right on in there.